← I’m a crying baby! 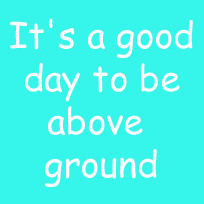 It’s a good day to be above ground! After releasing my last full- of- self- pity post, I called my supportive spouse. Which is right. I’m the pessimistic one, he’s my opposite. What would he do without me ranting. (manage, no issues, he would say). What would I do if I had a pessimistic spouse. One in the house is more than enough. These are some of your comments, got me thinking about this whole blogging thing. Unfortunately not all could fit into small squares and circles, but all were highly appreciated and most inspirational and effective. It is. Thank you all. Glad you liked it, the comments were so nice and uplifting that I had to share! 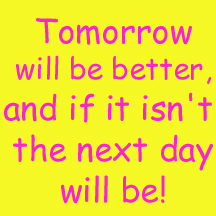 Last week I felt like my optimism was obnoxious. This post helps remind me that everyone needs an optimistic person in their life. Have been thinking of you. Glad to see you posting. We all have meltdowns, and some of them are very overwhelming, but hopefully the sun is shining for you again. It is Tric, thank you very much. Just working on the contributors page, you will like it I think. Will mail when ready. Glad to hear you are feeling better. 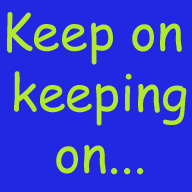 My husband and I both haves ups and downs – we just try and not have them at the same time. Some of the most supportive people I know are folks whom I hadn’t met when I needed them. And they were uplifting and sympathetic and meant the world to me. I’ve met some of them, over the years, in real life. 🙂 It’s a delight. I’m optimistic in our house. Sometimes he’s right, sometimes I am, it does all work out (in my view.) 🙂 Loved this. I’m glad things are on the upswing. Some days, I can’t wait to go to sleep and then wake up and start all over again. That’s the beauty of sunrises and sunsets and new days. Hugs to you and your family and friends– I hope everyone is weaving their hopes and sorrows into a new day. How is your dad? Is he getting good treatment? He’s a lot better, many thanks! Finally getting the high-sign from my lawyer that we’re moving forward, so, yes, it is a good day. I can celebrate with you! Never thought of incorporating responses into a post. Nicely done! I have a pessimistic husband. Every relationship has to have one I guess. We’re both self-proclaimed realists, though I’m slightly more optimistic than my wife is about dealing with the fallout of things beyond our control. 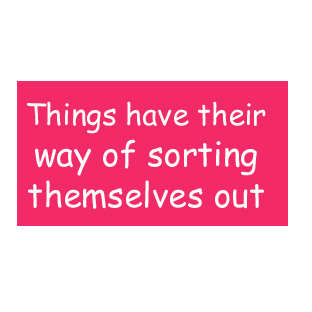 If life has taught me anything is that some things just are what they are and that we’ll adapt. We always do. Your dad seems as a special person, and this say has really uplifted me. I told many people about it. I am sorry for your lose, both your parents at the same time! It seems that your dad’s wisdom is still helping people though, doesn’t it? I posted it so that many people can read it and I wouldn’t be the only one, but also so I can see it easily in my next dark days. I hope you feel better in no time. Keep in touch. Dad was an amazingly optimistic person. Even with terminal cancer, he was never ‘sick’. He only grudgingly admitted he had a ‘condition’, if he had to. He and my mom were truly special people, and you have no idea how wonderful it feels that my Dad’s words, my Dad’s view of life, is being shared with so many. 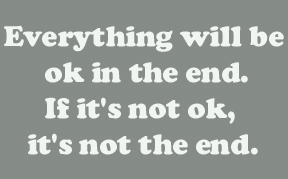 I love this one: “Everything will be OK in the end. If it’s not OK, it’s not the end.” I hope you’ve reached the end and that everything is OK now. It is a good day to be above ground.. even in the rain! I hope you are feeling better.. My husband ‘thinks’ his way through life and I ‘feel’ sometimes it causes problems, especially early on, as it is hard to figure out where each other are coming from. But, I have since discovered the benefits.. I have taught him how to deal with my ‘whinning’ and I have realised it is nice to have practical tasks done before I even realised they needed doing. Life is hard though.. but fun too! I love the motivational phrases. Those could come in handy more than once. Lovely upbeat post. Can’t get enough wordpress positivity, especially in the doom and gloom financial climate! I say whine on sister! Sometimes the only way to cure it is by letting it out…specifically to people who aren’t going through it with you. Glad you are having a better day, but can totally appreciate the bad days too. Love your blog! My husband is the pessimistic one, He says he is Realist. I just say he’s Fuddy Duddy and can’t see the glass half full, ever. Indeed! And most often, it’s all about balance and coming to compromise. That is the stuff of both longterm relationships and parenting.